The United States of America is almost 250 years old, but American women won the right to vote less than a hundred years ago. And when the controversial nineteenth amendment to the U.S. Constitution-the one granting suffrage to women-was finally ratified in 1920, it passed by a mere one-vote margin. The amendment only succeeded because a courageous group of women had been relentlessly demanding the right to vote for more than seventy years. The leaders of the suffrage movement are heroes who were fearless in the face of ridicule, arrest, imprisonment, and even torture. Many of them devoted themselves to the cause knowing they wouldn't live to cast a ballot. The story of women's suffrage is epic, frustrating, and as complex as the women who fought for it. 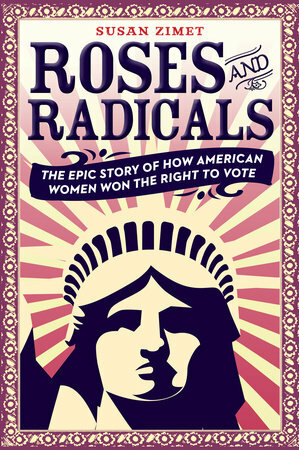 Illustrated with portraits, period cartoons, and other images, Roses and Radicals celebrates this captivating yet overlooked piece of American history and the women who made it happen.